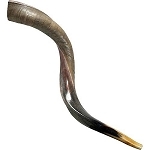 A Half-Polished Shofar is a Shofar that is only polished on one side of the Shofar in a spiraling motion. Our Half-Polished Shofars are some heavier that h Polished Shofar. They make a beautiful addition to any household.